Darwin letter reveals, "I do not believe in the Bible"
While many scholars believe Charles Darwin was an agnostic or even an atheist, it can be difficult to find hard evidence to back up those beliefs. He was reluctant to discuss religion and his writings are often silent on the issue. But now a simple one-sentence handwritten letter signed by the naturalist offers proof he did not believe in God. The letter, written 21 years after the publication of "The Origin of Species," was auctioned off Monday afternoon at Bonhams in New York. It fetched $197,000 at the auction, three times the previous record of $59,142 for a four-page letter that Darwin had penned to his niece. Darwin's letter is a reply to a young barrister named Francis McDermott, who wrote on November 23, 1880 with a very unusual request: "...If I am to have pleasure in reading your books I must feel that at the end I shall not have lost my faith in the New Testament. My reason in writing to you therefore is to ask you to give me a Yes or No to the question Do you believe in the New Testament." McDermott continues by promising not to publicize Darwin's reply in the "theological papers." The next day Darwin responded. He wasn't brusque but he was to the point and left no doubt about his beliefs, stating: "Dear Sir, I am sorry to have to inform you that I do not believe in the Bible as a divine revelation & therefore not in Jesus Christ as the son of God. Yours faithfully." McDermott promised not to publish the correspondence and he kept to his word. The letter was unknown to scholars for over 100 years. "He has no hesitation about it. He doesn't beat around the bush," Cassandra Hatton, director of Bonhams history of science and technology department, told CBS News. "He is direct about what he thinks. It's a one-sentence letter. He doesn't try to make the young man feel better or make an apology. He just directly says I'm sorry to inform you that I don't believe in the Bible. It's very clear." Matthew Chapman, the great-great grandson of Darwin who is also the president of sciencedebate.org, a group is trying to persuade the final presidential candidates to have a debate on science and technology, said Darwin may have been open about his beliefs in the letter because he was approaching death. "You have to remember this was written two years before he died," Chapman told CBS News. "I don't think you screw around with this kind of stuff. You say what mean. I don't think you are inclined to lie or showboat. You know you are facing death at that point and so I think this is a clear and honest expression of his atheism." Chapman said he found Darwin's response enlightening given the highly charged nature of the issue. "The guy who wrote the letter was asking, should I read your work or will it challenge my faith? I think that is as interesting as Darwin's response," he said. "This guy is saying, if there is anything that challenges what I believe already I don't want to hear it. In that context, Darwin's reply was pretty kind." Darwin grew up going to church and studied theology at Christ's College, Cambridge. But his views began to change after he took his history-making voyage on the Beagle. He returned to write "The Origin of Species" in 1859, the book that would detail his theory of evolution through natural selection. It sparked huge debate in Victorian England and prompted questions over Darwin's religions views. Darwin rarely discussed religion, probably to respect the feelings of his friends and family. Just a month before penning this note, Darwin wrote to the prominent atheist Edward Aveling, "It has ... been always my object to avoid writing on religion, and I have confined myself to science." Darwin died in 1882. Rumors of a deathbed conversion were widely believed but firmly denied by his daughter. "Many people theorized he changed his mind towards the ends of life and there has been speculation about a deathbed conversion," Hatton said. "But this letter again is late in his life. That would kind of throw doubt on the conjecture that Darwin did believe in God towards the end of his life." 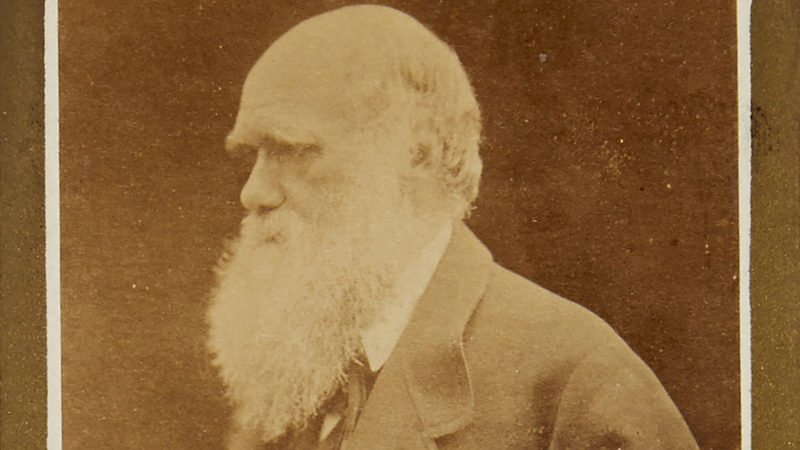 Darwin remains a deeply polarizing figure today and is despised among those who believe in creationism, the theory that God had a hand in evolution. "I find his atheism interesting. When you balance that against his scientific achievements which were so rigorous and so detailed and so prolific, it should be a fairly small thing," Chapman said. "Certainly in England and Europe, this wouldn't be much off an issue. He was a great scientist and this was the conclusion he came to." Along with the Darwin letter, the auction sold several other items important to the history of science. Among them was a Apple-1 computer, the first pre-assembled personal computer to come to market. It is in mint condition and was estimated to go for as much as $500,000. Details of the winning bid were not available. There was also Nobel Prize medal awarded to George Minot in 1934 for his pioneering work on the treatment of pernicious anemia that went for $545,000 as well as a prototype of the Kenbak 1, the world's first personal computer, that went for $31,250.